Superior litigation services are in store for clients who use the Esplanade Conference Suites. Situated in the midst of the well-known Camelback Corridor where 24th Street and Camelback Road meet, this Phoenix facility is a vibrant location in the region. Seventh-floor windows provide glorious, confident views of distant mountains. Take advantage of the latest court reporting equipment. 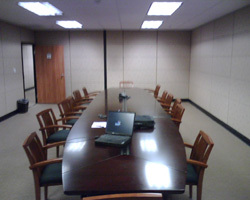 Three litigation rooms are perfect for small groups of eight or less people, and an impressive meeting room comfortably accommodates up to 30 people for larger needs. Expert staff is dedicated to helping clients enjoy all available benefits during their stay. Within the complex, clients find several exclusive amenities geared toward upscale lifestyles. The posh Ritz-Carlton Hotel, a comfortable movie theater, elite restaurants and a variety of unique shops are available without ever leaving the building. The distinguished Biltmore Fashion Park is just across the street presenting myriad dining and shopping opportunities. For other lavish lodging options, the superlative Arizona Biltmore Resort is only minutes away, offering a lush golf course, illustrious tennis facilities and a relaxing spa.